Your pet dog is a part of your family, but did you know that all dogs descended from wolves? Yes, your sweet, lovable pet is related to fierce wild dogs. Men first tamed dogs over 12,000 years ago and used them for jobs like watching sheep or protecting the family. Today, some dogs still do these jobs, while other pet dogs just want to love and play with their owners. 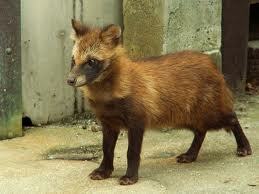 The raccoon dog is a furry dog that looks like a raccoon and can Climb on trees. Read on for more all about the dog family. All dogs belong to the canine family. This family includes coyotes, wolves, domesticated dogs, foxes and wild dogs. Hyenas look like dogs, but they’re more closely related to cats. 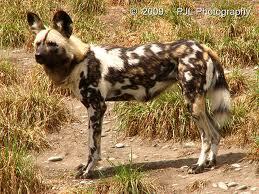 African hunting dogs have large ears and beautiful fur. Pet dogs have many of the characteristics of wild dogs. They’re smart and have a good sense of smell and hearing. The raccoon dog is a furry dog that looks like a raccoon. It is the only dog that can climb trees. Wild dogs run in packs, or groups. A pack has a male and female leader. Wolves belongs to dog family. A video documentary about the different kinds of dogs, their talents and what makes them unique from each other. 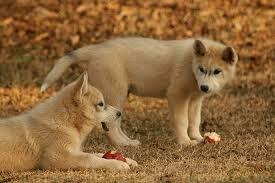 Question 1: Would wolves and coyotes make good pets since they’re related to dogs? Answer 1: No, these animals are wild and would not make good pets. Question 2: Do dogs and wolves communicate with each other? Answer 2: Yes, members of the dog family use scent, body language, facial expressions, eye contact and barks or howls to communicate. Question 3: Have dogs got good hearing? Answer 3: Dogs have excellent hearing, dogs have much better hearing than us and can pick up sounds that we cannot. Question 4: Is chocolate bad for dogs? Answer 4: Yes chocolate is very bad for dogs. I know its difficult to eat your favorite candy bar in front of a cute begging dog but chocolate can be extremely dangerous to dogs. A dog digests chocolate a lot more slowly than we do and chocolate contains the compound theobromine that can prove deadly to dogs. So please avoid the puppy eyes. Question 5: What is the fastest dog breed? Answer 5: The fastest dog breed is the Greyhound. A Greyhound can run at speeds over 40 miles per hour. Greyhound racing is very popular. Question 6: Have dogs got better eyesight than humans? Enjoyed the Easy Science for Kids Website all about the Dog Family info? Take the FREE & fun all about the Dog Family quiz and download FREE Dog Family worksheet for kids. For lengthy info click here. Declan, Tobin. " Fun Dog Facts for Kids ." Easy Science for Kids, Apr 2019. Web. 23 Apr 2019. < https://easyscienceforkids.com/all-about-the-dog-family/ >.